Mass Effect Cast Cosplay Initiative | The Official Base of Operations for the MECC Initiative. while fans give back to St. Jude Children’s Research Hospital. The Mass Effect Cast Cosplay event was a HUGE success!!! We nearly filled the Main Theater at PAX East, had 10,000 people watch the panel live, and nearly 6,000 people have watched the archived stream as of 4/15/2014! On top of that, our Smiles for St. Jude photo op and raffle for Keythe’s Thane mask raised over $6000 in the span of an hour and a half for St. Jude Children’s Research Hospital. WOW!!! There is a massive list of people without whom this would not have been possible. Be on the lookout for a full list of acknowledgements soon. Welcome to the Mass Effect Cast Cosplay Initiative! Our goal is to gather as many of the voice actors and models as possible to cosplay as their respective characters, after all this happened. Participating costumers are doing so on behalf of themselves and/or their respective creative labels. Participating talent are doing so because they’re amazing and fun and we as fans are lucky to have them. Any support shown for the initiative is done without compensation on either side. Any donations gathered from fans for the project are meticulously documented and applied ONLY to costs associated with this initiative. Any donations exceeding the costs of the initiative will be donated to St. Jude Children’s Research Hospital. These donations will NOT be individually tax-deductible, as they will be donated under this initiative’s name and names of participating talent. To donate to the Initiative, feast thine eyes upon this page. The event will take place on Saturday, April 12th at 2 PM in the Main Theater at PAX East 2014 in Boston, Mass. We will inform you on our official Facebook page of new information. Please DO NOT ask any talent, agents, cosplay groups, fan groups, costumers, or other individuals other than the MECC Project Manager and/or Board members for specific information on these details as they are bogged down as it is (read: be respectful, as everyone involved is donating his or her time for the fans). All questions should be directed as posts on our Facebook page. To see how you can help, please email the Project Manager, Karissa Barrows, at masseffectcastcosplay@gmail.com. Hackers, spammers, and haters shall be smote with a vengeance never before seen by the light of day. Thank you for your support, and a HUGE THANK YOU to the actors and models who have already graciously agreed to participate! 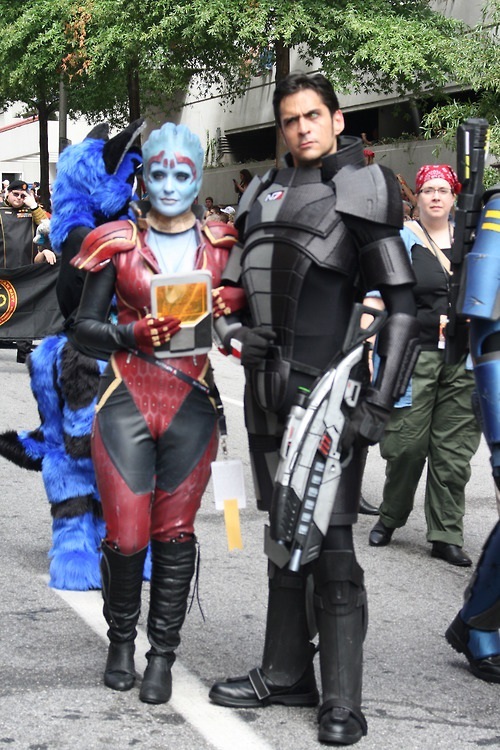 The Mass Effect Cast Cosplay Initiative is a fan-driven initiative, not directly affiliated with or sponsored by EA, BioWare, actor/talent/agency, press outlet, or specific fan or cosplay group. It’s fans like you that the world needs more of to lead fans not a resourceful to reach something epic like this so we can all enjoy! Thank you for what your accomplishing! You guys are amazing! What other game has half such a dedicated cast? If you get mark vanderloo in shepard cosplay that would be so awesome! Alright, I’ll be honest, I hadn’t played Mass Effect before, and I just went to the PAX East panel with my friend. But I have to say that this community really has impressed me. I’ve bought the game on Steam, and I plan on playing it before my next PAX. I was also VERY impressed with the stage presence of the emcee, Karissa Barrows. She was just fantastic.